Looks great, nice and bright and vibrant! the MML LED looks to put out a nice colour! I'm rather pleased with it! plants have gone and spread out a noticeable amount since i swapped LED lights. time to remove the sword I think and replant some stems. I reckon neelde java in the corner. Don't do too much stems, unless you enjoy trimming. Nice work with this tank! The yellows multiplying yet? Yellows are multiplying like crazy! still small in size, but they are getting there. Ill have some for you soon if you still want? So thought id throw a quick update in, now pics atm will take one last pick before I shut the tank down to be transported to the new home. this tank will go into my computer room and ill throw a new scape together I think. Most shrimp died off and snails took over. 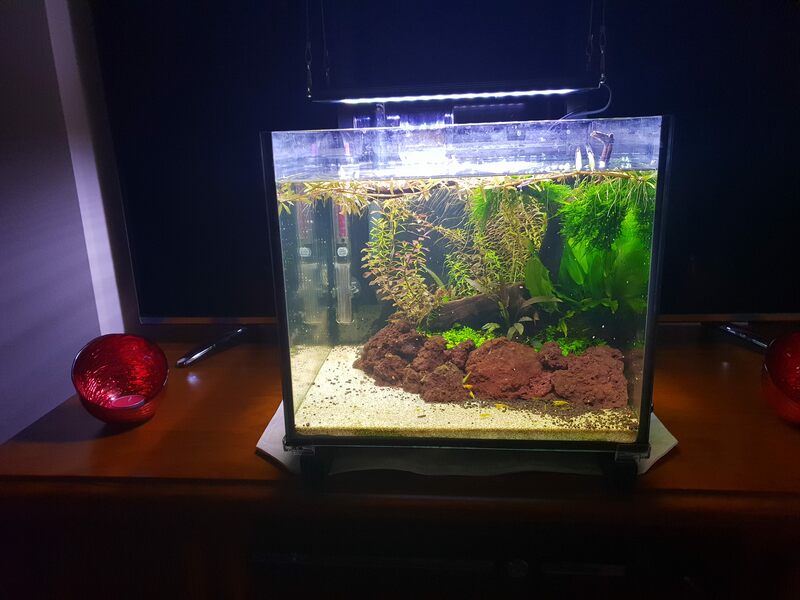 Will keep a better eye on it next scape thats for sure. Looking forward to the new scape though. You're saying NOOOOO, should have seen how bad I felt when I noticed majority had disappeared lol. 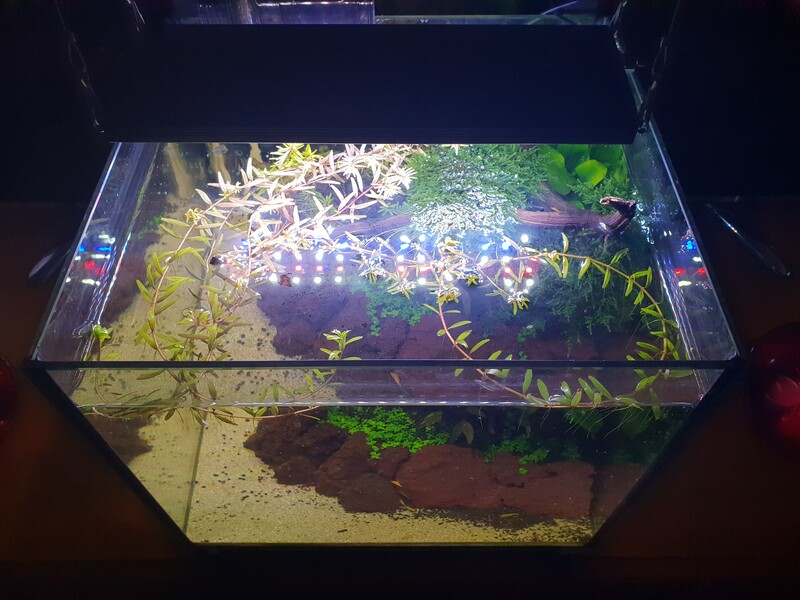 Yea not sure what I will do with the new scape, but ill be using whatever I have in this tank to built it, and perhaps some extra drift wood. well a rescape occured when moving it to the new unit, its basic, nothing overly fancy. Will probably rescape it again as im not too fussed on it yet. ill give it a chance. Looking good. Can't see a lot of detail on those photos but maybe post some some up if you can. IMO the light hanging makes it more cumbersome say compared to a simple Chihiros A series or similar. 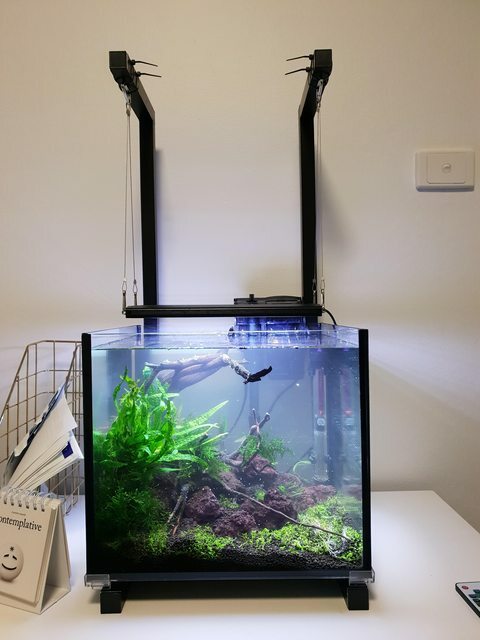 Did you deliberately hang it fairly close the tank? I really like how the tank looks like it's floating!! I put 3 CPD (full grown) in my cube and they look too big!! Last edited by luked; 01-11-18 at 07:14 PM. @DDM you have red cherry shrimp yea? Seems I inherited some of them, just noticed 3 of them running around. Super red too...! Moved the Harlequin Rasboras into the 4x2x2 to give the shrimp freedoms. Hoping the two ARE M/F and breed. 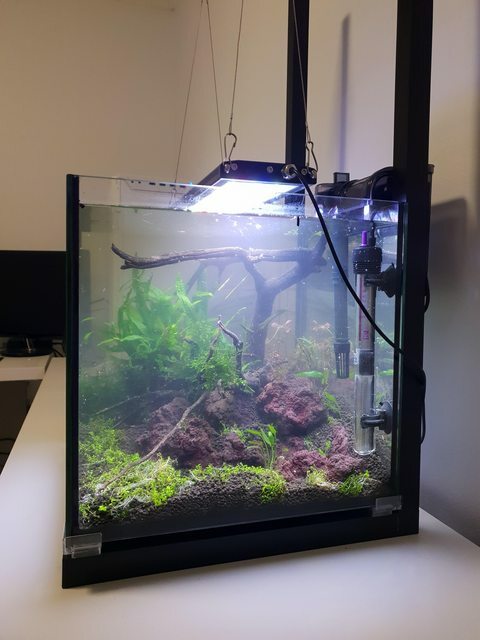 Also considering a rescape in this tank already, im not happy with the purple lava rock, and I now have some Niwa rock free to use wherever, I have a thought in mind about having grand canyon style theme with a few bits of small driftwood creating some perches with moss on them. Time will tell if I make a decision, or buy bookshelf tank and do it in that instead lol.